You know what my commute* is really missing? Being able to peruse the Dota 2 item store and see which bits of cosmetic frivolity I want to purchase the instant I get back to my computer. Or touching up on exactly which combination of Quas Wex or Exort makes the EMP, or Ghost Walk. Or just what the hell is the point of Dagon. 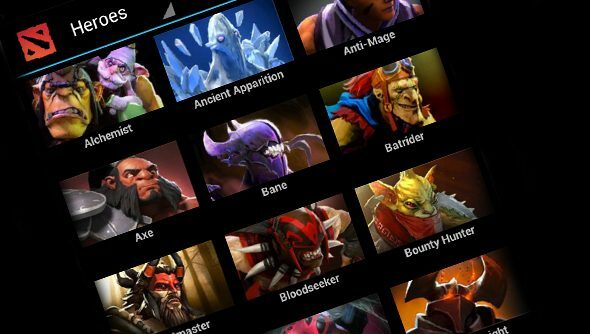 So it’s actually quite convenient that Empty Tea House have developed an app, Dotapedia for Dota 2, on Android that pulls all the data from the Dotapedia, the Dota Store and the Steam news feeds for Dota 2. It’s surprisingly slick, if I’m honest; you get a grid view for all of the heroes, and then can press on any of them to get a detailed readout of their stats, their Lore, and then on a different page, their skills. The item pane is just as detailed, and on the store page, while it’s filled with a few odd items like ‘Phantom Lancer’s Head’, when there’s an item that’s actually for sale it gives you the price in dollars, pounds and euros, which is a nice touch. It comes in both a free and paid for version, with the latter coming in at £0.63, and the free version being supported by ads. The real test, however, will be whether it can be kept up to date with patches, new heroes and any other changes Valve make to the game. If it does, it’ll be an invaluable resource. *That would be, if I actually commuted. I work in my bedroom, in my pants, like any good games journalist.